Media captionWill it be football, science or journalism that Rony ends up pursuing? 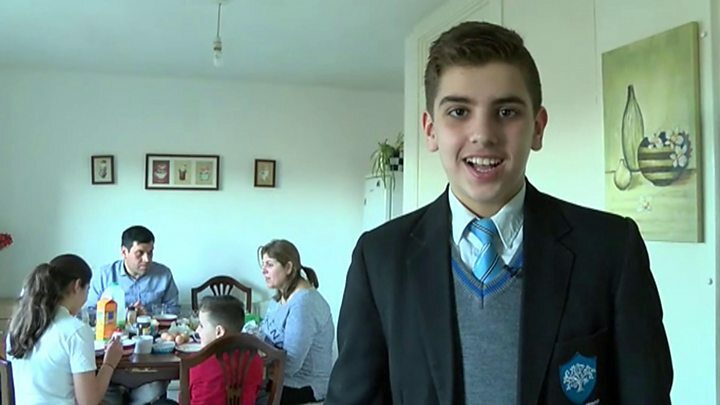 A Birmingham schoolboy, who fled Syria as a nine-year-old refugee, has said his dreams of becoming a scientist can finally become a reality living in the West Midlands. Rony, from Balaam Wood School, in Frankley, described how his life has changed since leaving the city of Qamishli in his homeland. The 12-year-old has grasped the English language after initially finding it challenging to communicate, and now has lots of friends. Rony, who lives with his parents, sister and brother, said that because of the war in Syria he had not thought his dream of becoming a scientist was achievable. But moving and adapting to life in England has helped him realise his dreams are possible. Here BBC News School Reporters from John Henry Newman Catholic College, in Chelmsley Wood, asked Rony about his life and spoke to his school mates and teacher. What dreams do you have and how did being in Syria affect them? "I wanted to be a scientist but if I was in my country there wouldn't be any dreams or any future for me. I want to be a chemistry or physics scientist and I believe I can achieve those dreams in England." What did you leave behind and how hard was it? "I had to leave behind clothes and my house. It was hard because other members of my family are still there. I left behind my friends as well and that was hard because I thought I wouldn't have any friends. Life in Syria was a lot harder because of the war." What's it like being in Birmingham and what was it like to learn a new language? "I have a good feeling here, I like the people and how they respect other people. Not a lot of people know different languages but I know three now - Arabic, Kurdish and English." What was the experience of your first day in an English school? "It was embarrassing because I couldn't speak English. Now I can speak with anyone I want. It's better in England because the education is better." "My new best friend is a boy called Dominic and we've been friends since I started at Balaam Wood School. We became partners in art lessons, started talking and became friends. We always talk about Xbox and games. My favourite game is Fifa and I play as Manchester United. I like them because they've won a lot of leagues and my favourite player is Zlatan Ibrahimovic." Image caption Sean, 12, speaks to BBC News School Reporter Eleanor, also 12. What did you think of Rony when you first met him? Sean, aged 12, from Balaam Wood School: "He was really shy but over time he grew really confident. Then we moved to secondary school and he was just a normal kid and it was just like nothing had ever happened to him." What have you learned from Rony? Aliza, aged 12, from Balaam Wood School: "Any obstacle in life, anything that happens to you, there's always an end and something that can make you happy. "Rony easily settled in to a different atmosphere, he's just a person you can put anywhere and he's happy." What did you do to make him feel welcome? Sean: "I was kind to him. He came into my primary school and he didn't know anything so I helped him out, became his friend and he made different friends." How difficult was it to understand Rony when he first got here? Sean: "It was difficult because he didn't know any English so it was hard to communicate with him. But over time he's learned English and we got to learn about him and what he liked." Where did you think Rony was from? Aliza: "I didn't exactly know where Rony was from, but I knew he was from a different country.... I could tell from his accent but I think he's done really well to learn English." Image caption Balaam Wood School teacher Deborah Mole speaks to BBC News School Reporter Pacey, aged 14. What experience do you have with children like Rony? Teacher Deborah Mole: "More and more children at schools in Birmingham are coming from overseas. It's important that we help them fit in and share our experiences. Doing this School Report project with him has been really powerful and I think it's helping children learn about each other, and not just in a classroom situation." What have teachers and pupils learned from having Rony in you school? "The most lovely thing is that kids are kids wherever they're from and they all deserve the same chances. When you see Rony with his friends doing their dancing, they're just like normal children. You can learn so much about the world from meeting people - you don't have to actually get on a plane to go anywhere. Having Rony talk about his experiences in Syria is really valuable." How do you think Rony is making progress? "I think he's doing amazingly. Three years ago he couldn't speak English and now he sounds like a Brummie."